String Duo for a Military Dinner in Bedfordshire – This week Manor House Music were privileged to be asked back to a local barracks to provide music for a military dinner to commemorate the Battle of Britain. As live music was needed before, during and after the meal with guests spreading out across two rooms, we suggested hiring a string duo (with violin/ viola combination) as this is more portable and can move easily between rooms – unlike a string quartet. A string duo also provides a sound which projects well but doesn’t overwhelm conversation on nearby tables. As the building we were playing in was many centuries old with plastered ceilings, the acoustics were helpful in that they didn’t dampen the sound, nor were they so reverberant as to make conversation overly boomy. As is customary at military dinners, we were asked to play the National Anthem for a toast to the Queen but also on this occasion we were required to perform the Star Spangled Banner in tribute to American guests who were present. We did not originally have an arrangement of the American National Anthem for string duo, I had to swiftly arrange it for two instruments in time for the event. 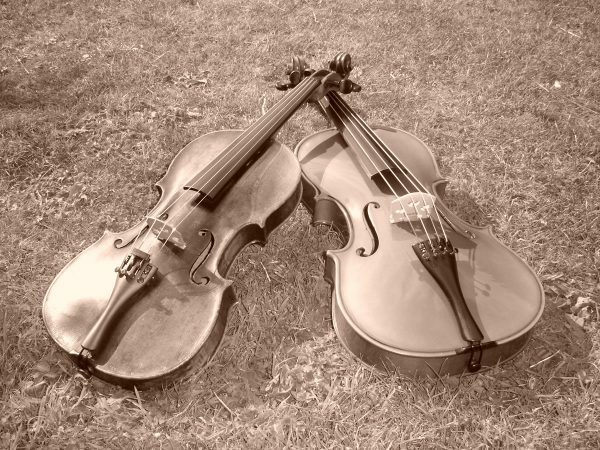 Although this was quite a last minute booking, arranging a second¬†player for a string duo is far easier than co-ordinating four clients wishing to hire a¬†string quartet and being a week-day evening we were much more likely to be available than a daytime or Saturday afternoon.